Posted August 10th, 2015 by admin & filed under Hand/Wrist. Let’s talk carpal tunnel syndrome…wait…have you already read up on it? It’s all over the internet. Has everyone already loaded you with up with advice? Everyone has an opinion about what you should do. Well…I don’t want to bore you, but this is one of THE most common questions I get when I say I am a certified hand therapist!! If it’s not for them, it’s for a family member or a friend. I was just having lunch at a going away party for my friend and her son, when one of the other mom’s asked me because her mother has carpal tunnel and is considering surgery. 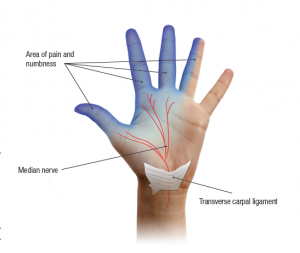 Carpal tunnel syndrome (CTS) happens when the median nerve gets compressed around the wrist area. 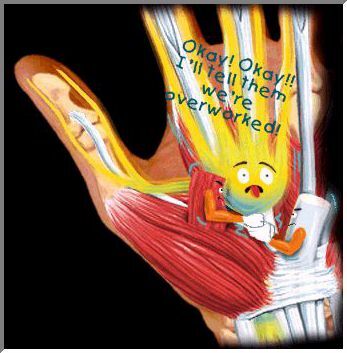 The “tunnel” is comprised of the median nerve along with eight other tendons! It’s a pretty tight fitting area. Think of it like a rubber band wrapped tightly around a bundle at your wrist area. For various different reasons, there is swelling or inflammation at that area and that rubber band squeezes tighter and tighter, pressing on the median nerve. This can cause pain, numbness and tingling, at worst atrophy (muscle death). Remember the woman that wore her skinny jeans too tight and it cut off her circulation? It’s something like that, but not as severe especially if you get help when you first start having issues. Pain mostly occurs at night, numbness or tingling sensation at various times, and over time can also result in weakness and atrophy of the muscles that the median nerve supplies. It’s annoying and can get in the way of your rest and function. Consult your doctor or hand therapist. They can do some clinical testing at first and can also recommend a nerve conduction study to see how bad the compression is if your symptoms are worst. Generally speaking, per protocol, at first orthoses are recommended to wear at night (ONLY at NIGHT) to help position the wrist in a way to let the area rest for about a month. If this helps, then YAY! These wrist support orthoses can be issued by your doctor or can be purchased on your own if you know what to buy. I prefer custom fitted orthosis because in the past, patients that use them complain less about the fit and comfort. But in this day and age, they are much more expensive then the store bought kinds. I have worked with patients at this stage really for the education purpose and also to help them see what other signs to look for, ways to exercise, and modify their activities so that the carpal tunnel doesn’t get worst. Usually only one or two sessions at the most. If numbness is constantly there, orthoses worn at night do not help, nerve conduction study says you’re moderate to severely compressed, and you have spoken to your orthopedic surgeon about having the carpal tunnel release, this may be more interesting to you. Please don’t wait until you start seeing atrophy…it’s when the muscle wastes away and you see these pockets where the muscle used to be…it’s really not a good thing. Surgery is surgery matter how small and “easy” it is. Carpal tunnel release surgery is like someone going in there and cutting that rubber band open so your nerve can move and breathe better. Relatively speaking in the hand therapy world, it’s pretty easy, you don’t have any precautions except that you want to take things slowly as you are able. You are allowed to move the fingers and wrist after the doctor or therapist removes the post-op dressings, encouraged to get full range of motion, and use the hand as much as you can. The hardest part of it is the pillar pain at the palm area can last for 2-3 months but should get better with every passing month, and fully pushing down on the hand like in a push up position is not comfortable until about 3 months post-surgical. Oh…can you please whatever you do, don’t squeeze in a ball!! You want to move your fingers fully, then learn tendon gliding exercises (which I will put up a video soon) or just OPEN and close your fingers fully and slowly. I strongly hate the use of a ball because it actually makes your carpal tunnel worst (before or after surgery)! Sometimes formal therapy can be very helpful to make sure you are getting all of your motion in a timely manner, working to manage the scar and swelling, and education to make sure no complications develop. I hope this has been helpful if you or anyone you know has carpal tunnel. I believe this was exactly my conversation with my friend today. Please give us a call here at Hands on Therapy Services for more direct help and set up your therapy appointment! Hands on Therapy Services is a leading Miami certified hand therapist, specializing in carpal tunnel syndrome, rehabilitation of shoulder, elbow, wrist, and hand injuries resulting from injuries, surgery, or naturally occurring conditions. Our Miami hand therapy services are provided by our certified hand therapist in Miami. We also offer occupational therapy in Miami with our on site occupational therapist. Plus – coming soon – we will be offering physical therapy in Miami. Thank you. Laser is not a treatment that I provide but always good to know about. Thank you for the feedback! Woh I love your articles, saved to bookmarks! . Thank you! Thank you! Please sign up for our newsletter or follow us on social media for even more information!